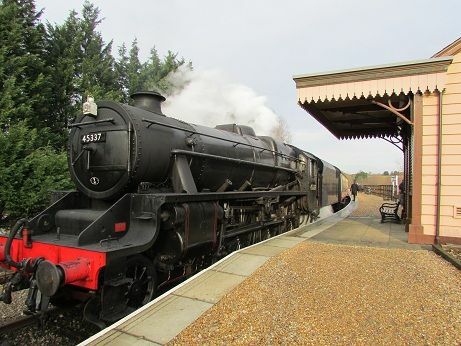 12/1/2014 - Wansford to Yarwell Junction. Yarwell Junction to Peterbrough Nene Valley. Peterborough Nene Valley to Wansford. My first railway journey of 2014 happened to be on a preserved line and one I hadn't been on for over twenty years. I had to drive up to Lincoln with my work on the Sunday, so a stop off on the way at the Nene Valley Railway next to the A1 was perfect. I'm glad that they actually bother to run trains in January as it is has been quite mild, despite all the rain. It's worth doing as so many families and railway enthusiasts still like to go out on a sunday in the winter if the weather's OK. The NVR had three trains running as well as the cafe open, so my wife and I arrived in good time for lunch in the cafe before taking the 2 o'clock train to Yarwell Juntion and Peterborough and then back to Wansford, before continuing our road journey to Lincoln. The weather was quite sunny and you could see traces of the recent flooding in this area. We were pulled by Black 5, 45337 on our trip, which was nice and there must have been about thirty passengers on our train, so hopefully it was worth it for all the volunteers who gave up their time. 25/1/2014 - Hucknall to Mansfield and return. Went to the Mansfield vs Wycombe Wanderers match after driving up from Essex to Nottinghamshire. Rather than drive all the way to the ground and not get a parking space I drove to Hucknall, just north of Nottingham where I was able to park for free. Then I cuaght a Robin Hood Line train from there which only took fifteen minutes and cost just £5.80 return. I then stayed overnight in a hotel as had to do some work in Leicester on the Monday. The next day I drove through the wind and rain to Barrow Hill Roundhouse where I was able to walk around the complex and see all the different locos there. It's free to get in but you can leave a donation, (whcih I did) to help with their work. 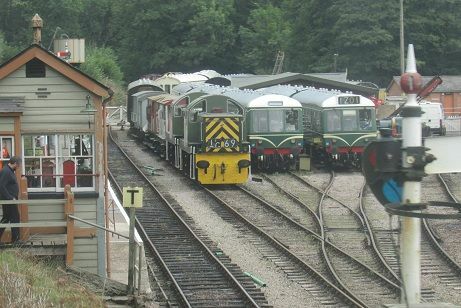 I would say that after York, it must have the largest collection of diesel and elcetric locos in the country. As it was a sunday the Deltic Preservation part wasn't open, but it was still nice to see so many locos in one place - in spite of the weather! 8/2/2014 - Leigh-on-Sea to London Fenchurch Street. London Paddington to Oxford. Went to Oxford for the weekend. I had originally booked to go by train rather than drive, as being February I expected snow, but instead I got floods! Even on the c2c line (which went via Tilbury due to engineering works) you could see plenty of flooded fields lineside. Then once we got out of London on the Great Western mainline you could see much bigger areas of flooded fields as we ran parallel to the river Thames for much of the way. I knew there would be hold ups in the Twyford area due to the line being fllooded, but it didn't look that bad and we were held up only a short while. Then both sides of Reading you could see widespread flooding of the fields. Finally once we were past Didcot, you saw even greater flooding south of Oxford, which meant speed restrictions, so we were about half an hour late arriving in Oxford. 10/2/2014 - Didcot to London Paddington. West Ham to Leigh-on-Sea. Although it had been a dry Sunday in Oxford the flooding had got worse over the weekend and we knew there would be problems returning to London. The taxi driver informed us that there was only an hourly service to London, but there were plenty of coaches taking passengers to Didcot. As we walked into the station a Class 166 was just pulling out with the 09.40 to Paddington, so we couldn't get that. In fact shortly after that a Freightliner train came through going south, so how come he was allowed through? We were due to get the 10 o'clock train back to London, but that had been cancelled. It said there was a coach service to Didcot but that wasn't due to leave until 10.20 according to the information board. So it looked like a wait of half an hour. There was a train going to Bicester Town leaving at 10.08 and i considered taking that and transferring to Bicester North and getting a Chiltern Trains train back to London. Then luckily someone announced that there was a coach ready to leave to take us to Didcot. In fact outside Oxford sation there were about five coaches ready to take passengers to Didcot Parkway station. Around twenty of us got on that and we were on our way. We left Oxford at 09.50 and as we drove westwards along the Botley Road you could see whole streets that had been flooded. Once we were on the Oxford bypass, it only took us about 20 minutes to get to Didcot Parkway where there were more coaches and stewards waiting. We were ushered straight through the ticket barrier and onto Platform 2 where there was a London train due in at 10.29, so only a ten minute wait. Howvever that had been delayed and it didn't arrive until 10.40. It had come from Bristol Temple Meads, but had been delayed near Bath due to singnalling problems. It was quite full, but we got a seat OK. The next hold up was just after Twyford in that section where the line had been flooded. It didn't look too bad, though you could see flooding at the side which presumably had covered and affected the signalling equipment. After a ten minute delay we were off anf finally arrived in Paddington about half an hour late. So not too bad a journey, and thanks to all the staff at First Great Western for all their efforts in keeping the passngers moving and the trains running in such difficult conditions. I'm gratefull I wasn't travelling from Devon or Cornwall! 21/2/14 Leigh-on-Sea to London Fenchurch Street. London Paddington to Swindon. Swindon to Gloucester. Had to go to both Swindon and Gloucester with my work, so once again I am travelling out of Paddington for the second time in less than two weeks. This time the trains all seemed to be running OK for my part of the Great Western area. 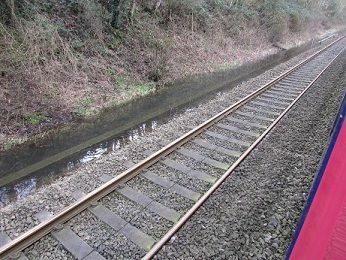 There was still some flooding of the track to be seen just west of Maidenhead, not that the train slowed down for it. Then again around Reading there was more flooding to be seen, though it had gone down slightly since ten days ago. Once I had finished what I was doing in Swindon I got the 12.38 to Gloucester. It said it was departing from platform 1 which is the furthest north platform at Swindon and the best one for taking the line north. But right at the last minute it was diverted onto platform 3, which is the London bound platform. At the same time a London bound train came into platform 3. Can anyone tell me what that is all about? The actual journey to Gloucester along this line through the Stroud area is one of the most pleasant in the south of England. I then stayed overnight in Gloucester. 22/2/14 Gloucester to Severn Tunnel Junction. Severn Tunnel Junction to Cardiff. Cardiff to Newport. Newport to London Paddington. London Fenchurch Street to Leigh-on-Sea. Only a week ago the line from Gloucester to Newport was closed due to flooding west of Gloucester, but thankfully the waters had subsided and the trains were now running normally again. However I could still see plenty of flooding either side of the track. I get off at Severn Tunnel Junction to take some pictures, before going on to Cardiff where I met a friend for a drink. Then it was back to Newport to see the Newport vs Cheltenham game. On the train back to London I sat next to a fan from Gillingham who had also been to the game and was doing the 92 like me. A week later I went up to the West Midlands with my work. I had to go to Walsall first and then onto Sutton Coalfield second. On the way my Virgin Pendelino suddenly lost power just south of Rugby and came to a complete stop for about ten minutes. You could see the driver by the track on his mobile phone. Then the train guard announced that we had been delayed due to overhead line problems. After about ten minutes the power came back on and we set off again, but we were about fifteen minutes late coming into Birmingham New Street. 1/3/14 Longbridge to Birmingham New Street Birmingham New Street to Sheffield. Sheffield to Rotherham Central and return. Sheffield to London St Pancras. Today after staying overnight in Birmingham I caught a train up to Sheffield and then to Rotherham to see the Rotherham vs Notts County match. My Cross Country train didn't seem to be delayed at all by the landslip near Dronfield and shot through the scene of it at speed. Coming back on an East Midlands train, we were actually diverted via Barrow Hill rather than go straight south. Does that mean that Cross Country takes precedence over East Midlands Trains? 7/3/14 Leigh-on-Sea to London Fenchurch Street and return. Went to see a friend in London. 19/3/14 Wickford to Shenfield and return. Shenfield to London Liverpool Street and return. Went to London for a course and decided to go on the Southend Victoria line for a change. When I got to Wickford there had been a fatality further down the line so several trains were cancelled including my London train, which meant a half hour wait for the next one. I decided to change trains at Shenfield, where I was able to get a non-stop train through to Liverpool Street. Coming back I caught the first train out of Liverpool Sreet changing at Shenfield once again. 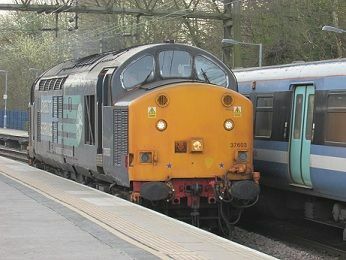 Whilst waiting for a Southend Victoria train, a class 37 came through the station light, so it was a nice surprise. I don't know where it was going. Possibly to Felixstowe? For the first time for many a year, no rail travel anywhere in Britain for these two months! 7/6/2014 Leigh-on-Sea to Barking. Rotherhithe to Shoreditch High Street. London Liverpool Street to Leigh-on-Sea. My first railway journeys for over two months. Due to engineering works between Barking and Fenchurch Street, trains on the c2c line were being diverted into Liverpool Street. As I wanted to get to Waterloo, I changed onto the tube at Barking and again at West Ham to go on the Jubilee Line. I then went onto Rotherhithe where I attended a dinner organised by Subterranea Brittanica in Rotherhithe, celebrating their 40th anniversary. Apporpriately enough it was held in the Grand Entrance Hall of Brunel's Thames Tunnel. Trains were only a few feet under us and as I left I caught an Overground Train to Shoreditch passing under the Thames' first tunnel. 14/6/2014 - Leigh-on-Sea to West Ham and return. 20/6/2014 Leigh-on-Sea to London Fenchurch Street. London Euston to Crewe. Crewe to Liverpool Lime Street. Liverpool Lime Street to Hamilton Square. Went up to Birkenhead to my old school for a reunion dinner. 21/6/2014 - Hamiltoin Square to James Street. James Street to Liverpool Lime Street. Liverpool Lime Street to St Helens Junction. St Helens Junction to Earlestown. Earlestown to Warrington Bank Quay. Warrington Bank Quay to Crewe. Crewe to London Euston. London Fenchurch Street to Leigh-on-Sea. Came home via some stations in the Merseyside/Warrington area that I wanted to take photos of. 24/6/14 Leigh-on-Sea to London Fenchurch Street. London Paddington to Didcot Parkway. Didcot Parkway to Bristol Temple Meads. Bristol Temple Meads to Weston-Super-Mare. Went away for a course in Bristol the next day. As hotels in Bristol were so expensive due to Glastonbury being on, I found a cheaper alternative in Weston-Super-Mare. On the way I stopped off at the Didcot Railway Centre for an hour or so, having lunch there and walking around the vast site. There was plenty to do though of course nothing was in steam. You could go on the footplate of several of the locos and look in some of the carriages being restored. 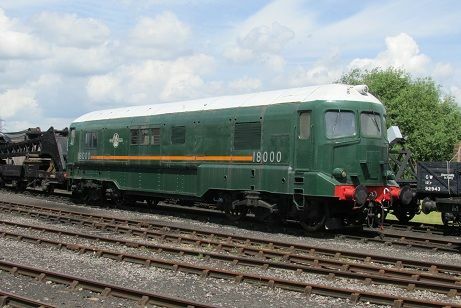 It was nice to see the prototype diesel locomotive 18000 there, though it didn't seem to have any info about it and was just sitting there in a siding outside the main shed. 25/6/14 Weston-Super-Mare to Bristol Temple Meads. Bristol Temple Meads to London Paddington. London Fenchurch Street to Leigh-on-Sea. Spent an enjoyable day in Bristol attending a course which was held in the docks area, near the SS Great Britain. There is also the Bristol Harbour Railway there complete with station, freight trucks and steam engine. It wasn't running today, but you could see it in the shed in the Wharf complex. Coming back from Bristol my train left Temple meads on time, but was actully ? minutes late into Paddington due to a late running train in front of us. For some reason whenever I come back eastwards to London on a First Great Western train, I am always late! 28/7/14 Wymess Bay to Glasgow Central. Glasgow Queen Street to Mallaig. Mallaig to Fort William. On holiday in Scotland with my family for the Commonwealth Games staying in Wymess Bay. Whilst they go to the games I arranged to complete travelling on the remaining Scottish railway lines. So on the Monday I caught a train into Glasgow Central and then walked to Queen Street. I then caught the 12.21 to Fort William. Trains up the West Highland route have two destinations: Oban and Mallaig, as the train splits at Crianlarich. For some reason we are kept waiting on the concourse with no indication of what platform it will be. Then about 12.15 we are told the platform, though there are only four carriages which means just two carriages on both routes from Crianlarich. There is the inevitable mad rush, but luckily my reserved seat has not been taken by the time I get on the train and I am facing forwards with a table seat. It is still very full, with almost all the seats having reserved tickets on them. It is also very hot and I need sunscreen on several occasions. Once we leave Glasgow behind and turn north by Helensburgh the scenery starts to become interesting. It's pretty much a mixture of high mountains and lochs all the way, apart from the section over Rannoch Moor. It reminds me how hard our ancestors must have worked to build this line, especially in such remote terrain. I get off at Rannoch to take a photo or two, and was going to do the same at Corrour but the guard was only letting people out at the back door of the train, so there wasn't enough time. I didn't want to get left behind at possibly Britain's remotest station! which pulls out as soon as we come in, so I wasn't able to get a picture of it. There's also the sleeper train in front of us on the same platform with a boring Class 66 hauling it. The train empties quite considerably at Fort William, but I stay on to go to Mallaig and back. It's less than a quarter full with plenty of room and it's mainly tourists on the train. When we come to the Glenfinnan Viaduct, the train helpfully slows to about 10 mph to go over the viaduct. This makes it easier to get some good photos and many passengers do the same as me, obviously having seen the viaduct in the Harry Potter films. It is quite a picturesque journey, though I am not sure if I would rate it as the best railway journey in the world or even Britain. When we get to Mallaig another Jacobite Steam train is waiting in the other platform to go out after us. I'm tempted to go back on it but still have three quarters of an hour to kill, so decline and walk round Mallaig. Also It's quite a long day - over eight hours in a train, so I get the last Scot Rail train of the day back to Fort William where I stay the night. 29/7/14 Fort William to Crianlarich. Crianlarich to Oban. Oban to Glasgow Queen Street. Glasgow Queen Street Low Level to Scotstounhill. Scotstounhill to Glasgow Central Low Level. Glasgow Central to Wemyss Bay. Got the first train of the day out of Fort William as far south as Crianlarich. It had started from Mallaig at 06. and stopped at Fort William for ten minutes before leaving at 07.40. I'm not sure if this train had stopped overnight at Mallaig station, or had gone light from Fort William depot first thing. This time I am able to get off briefly at Corrour and take a photo. I notice that the sign saying the highest station in Britain has broken free from its mornings and is now rusting flat by the side of the track At Rannoch I miss seeing the sleeper coming up on the other platform so don't see what's hauling it. I get off at Crianlarich at 09.30 with a couple of others as well as the guard who rests here before going back to Fort William. I decide to have a cooked breakfast at the Tea Room on the station for just £6 which is quite cheap compared to some of the places I've eaten in Scotland. There's lots of photos of trains and mountains for you to look at while you eat. It's quite busy with passengers arriving to catch the train which leaves at 10.15. This time there's six carriages on it with two for my section going to Oban. Once again my reserved seat is facing forwards at a table which is just what I requested. Thank you Scot Rail! The carriage is about three quarters full and this time the weather is cloudy and then it rains later on spoiling the view in some cases. Once again it's a mixture of mountains and lochs, most of the way. I notice on one section they have double semaphore signals raised for both directions which is quite unusual. At Oban there is a break of about forty five minutes before the train departs at 12.11 This time someone is sitting in my reserved seat but I'm not too bothered as I take a seat behind him in the corner so I can have a nap after such a bad night's sleep in Fort William. I wake up just before Dalmally station, where the guard announces that there will be a ten minutee break as the train that is due to cross over in the other platform is running late. It's a very unusual station which has been restored by a couple who run a weaving business from the station. There's all sorts of fabrics on display as well as an actual spinning wheel, plus a rabbit in a run! Eventually we do leave and as we near Crianlarich you can see the Fort William portion of the train across the valley trying to beat us. We do have to give way to it at Crianlarich, but we arrive in Glasgow more or less on time with some catching up in the Glasgow suburbs. I then catch a train out to Scotstoonhill to watch the table tennis event of the commonwealth Games, so I can say at least I've been to one event! Coming back to Glasgow Central the train we get back to Wemyss Bay isn't the usual state of the art Class 380 but instead is a run down Class 318 still in Strathclyde Transport Livery! I presume that other stock has been requestioned for the games. We do arrive at Wemyss Bay on time despite some trouble with the doors at Woodhall. 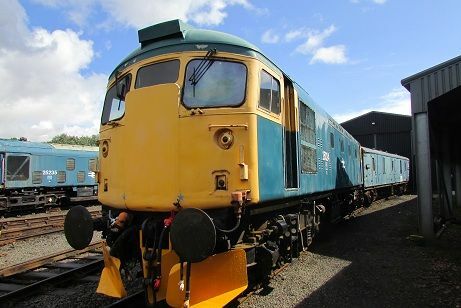 30/7/14 Stirling to Perth. Perth to Dundee. Dundee to Stirling. I went to Dundee for the day, but drove some of the way as far as Stirling. I did break the journey at Perth on the way as I wanted to explore the station which is so massive and quite interesting architecturally. It seems too big now for what it is used for. There's a nice set of paintings on platform 5? and it has recently had ticket barriers installed. Dundee on the other had is a much smaller station and there's a mess outside as all sorts of roadworks is taking place. I would have crossed the Tay bridge to Leuchars if I'd had more time, but still had a pleasant time walking round the city. 31/7/14 Bowness to Manuel and return. Went for a trip on the Bowness and Kinnell railway, as well as visiting the museum there. 8/8/14 - Leigh-on-sea to London Fenchurch Street. Wimbledon to Tooting and return. Wimbledon to Clapham Junction. Clapham Junction to East Croydon. East Croydon to London Bridge. London Bridge to Charing Cross. Just went on a few lines around London before meeting my wife at Kings Cross when she came home form a trip to East Anglia. 13/9/14 Leigh-on-Sea to London Fenchurch Street and return. London St Pancras to Derby and return. I went to Derby Etches Park depot open day as part of the Derby 175 Anniversary celebrations. I went on a special, organised by UK Rail Tours which left St Pancras at 08.35. This meant getting up quite early to catch the 06.51 train from Leigh-on-Sea into London. This was because at that time the trains are only every half hour and so getting the next one at 07.21 would have been cutting it fine to get across London to St Pancras. Surprisingly at that time the train was pretty full with standing room only between Barking and West Ham. The actual event was quite good, but pretty crowded at first. 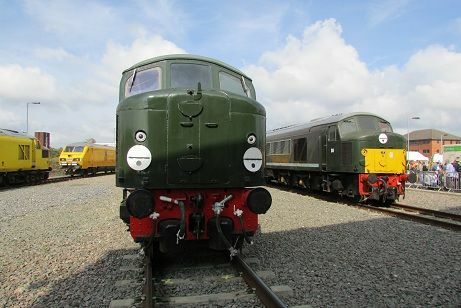 It was nice to see so many old diesels including both D4 and D8 next to each other. However there wasn't one steam loco on display, which was a bit disappointing, seeing as it was celebrating 175 years of rail transport in Derby. Went to see Kate Bush at Hammersmith Apollo, which was very enjoyable. However coming back I had to go to Liverpool Street due to engineering works between Fenchurch Street and Barking. Due to the time taking to cross London I arrived at Liverpool Street just as my 11.46 train was leaving. I had to then get the 12.08 which surprisingly was an eight car train which was very empty. 20/9/14 Leigh-on-Sea to West Ham and return. London Waterloo to Portsmouth Harbour and return. Ryde Pier Head to Smallbrook Junction. Smallbrook Junction to Wooton. Wooton to Haven Street. Haven Street to Smallbrook Junction. Smallbrook Junction to Shanklin. Shanklin to Ryde Pier Head. 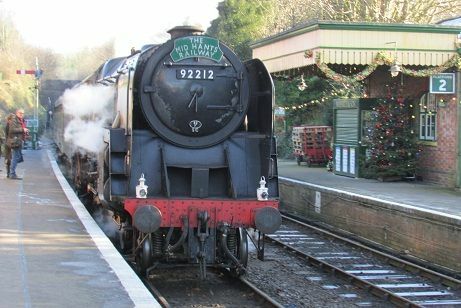 My second excursion in a week with UK Railtours on a trip to the Isle of Wight Steam Railway. We arrived at Portsmouth Harbour just after ten and went on a boat trip round Portsmouth Harbour before crossing to the Isle of Wight. We were actually about half an hour ahead of schedule, but rather than waiting at Smallbrook Junction for our connecting train we waited at the Pier Head for our scheduled train. I was very impressed with the Isle of Wight Steam Railway which seemed to be run effieciently by friendly volunteers. The train carriages were beautifully restored; in fact the Third Class carriages we travelled in were better than the 1st class on many normal trains! We had time to go down the Isalnd Line to Shanklin and back before returning to Smallbrook Junction. After driving to Barking on business got a train into London to visit the poppies by the Tower of London. Went down to Dover to see Dover Athletic play Chester in the Conference Premier League. I was going to drive to Tilbury and get the ferry across to Gravesend and then catch a train to Dover, but there was a replacement bus service between Gravesend and Gillingham. In the end I drove as far as Faversham and then got a train to Dover. This was a line that I hadn't been on since the 1970's so it was interesting to see how it had changed. Went to Hammersmith Apollo to see Cat Stevens. 13/11/14 Leigh-on-Sea to London Fenchurch Street and return. London Charing Cross to Waterloo East and return. Went to London for a business meeting. 29/11/14 Leigh-on-Sea to West Ham and return. Londo Waterloo to Woking and return. Went to Woking to see the Woking vs Braintree match in the Conference Premier League. Went to The Hammersmith Apollo to see James Blunt. Went to The Hammersmith Apollo to see The Human League. 12/12/14 Leigh-on-Sea to London Fenchurch Street and return. 13/12/14 Leigh-on-Sea to West Ham and return. 20/12/14 Leigh-on-Sea to Stratford. London Waterloo to Chiswick. London Fenchurch Street and Leigh-on-Sea. Went to see a friend in Chiswick and then onto The Hammersmith Apollo to see Chris Rea. 29/12/14 Alresford to Alton and return. Had a couple of days away with my wife in Hampshire. Went for a trip on the Watercress Line on the monday of our stay. I had been on this preserved line before, about five years ago, but still enjoyed it very much. Each station had been carefully decorated with Christmas decorations and trees and all the staff were very friendly. We also had lunch in the buffet at Alresford before our train ride. Normally this is closed on a monday, but as it was Christmas holidays it was open and well patronised. In fact there must have been around a hundred passengers using the railway today, so it does pay to keep these preserved lines open in the winter holidays. In fact the Watercress Line ranks as one of my favourite preserved lines!